When I was offered the opportunity to try Simple Health Magnesium Citrate, I did a little research and found that many of us are deficient in this mineral. It's a vital mineral for your body so I wanted to give this product a try. I tried it in water first, which is the recommended use. It doesn't have any flavoring added, but it did have a bit of an off-taste so I added my favorite flavoring - a squeeze of lime. Then it was fine, I was able to drink it with no problem. I also tried it with a drop of peppermint extract and that was delicious, too! However, my favorite way to incorporate this into my diet (and my son's) is to place a 1/2 teaspoon for each of us into the Vitamix when I'm mixing our smoothies! No taste, and no evidence it is even in there! I think it has helped our sleep and it is also helpful for improving our moods! This is a great way to get magnesium into your diet. I love it and we'll be using it regularly. The container is a great size - there are over 100 servings in this bottle! – Improves sleep by balancing melatonin and the stress hormone and aids body temperature regulation. It also balances serotonin, which relaxes the nervous system. Relieves stress, panic attacks, anxiety and depression. – Relaxes muscles, relieving cramps and helps prevent heart disease, stroke, kidney stones, migraines and gallstones. Another pleasant side effect is increased flexibility. – Female wellbeing, reduces PMS and menopause symptoms, as well as osteoporosis. – Alkalizes the body, balances the body’s pH, reduces lactic acid after exercise, hydrates and helps relieve constipation and cleanse the body of toxins. – Improves bone, teeth and muscle strength, helps the body utilize calcium properly. – Aids with Diabetes by enhancing insulin secretion. Personal Note : I chose a powder form because it is more easily absorbed by the body, even if you’re suffering from IBS or other digestive problems. The reason I chose flavorless powder is because it eliminates any sweeteners and flavors that could be harmful. Simple Health Magnesium Citrate is a Vegetarian/Vegan Product. Sugar, salt, starch, yeast, wheat, gluten, corn, soy, milk, egg, shellfish or preservatives. It will not cause diarrhea or dizziness if taken with or after food. Simple Health Magnesium Citrate is easy to swallow and flavorless, so can be taken with a juice of your choice! This product is formulated for optimum absorption, so you will feel the effects as soon as 5 minutes after taking a serving of Simple Health magnesium citrate. 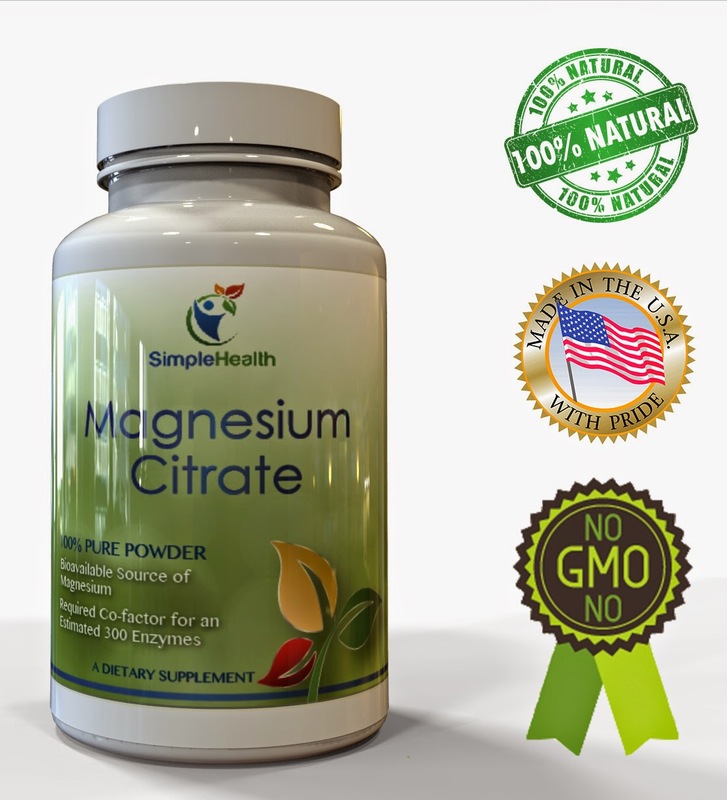 I received a bottle of this Magnesium Citrate in exchange for a review. No other compensation was received. All opinions shared are my own.